Roger is really over powered hero with this build, you can try this build and feedback by commenting. Items gives you attack damage but you are not durable. Tanky build means Warrior Boots, it’s just nice mobility and a lot of armor to add to your arsenal. High Physical Damage and Crit Chance, it makes our crits 40% stronger making it a key component of our build. 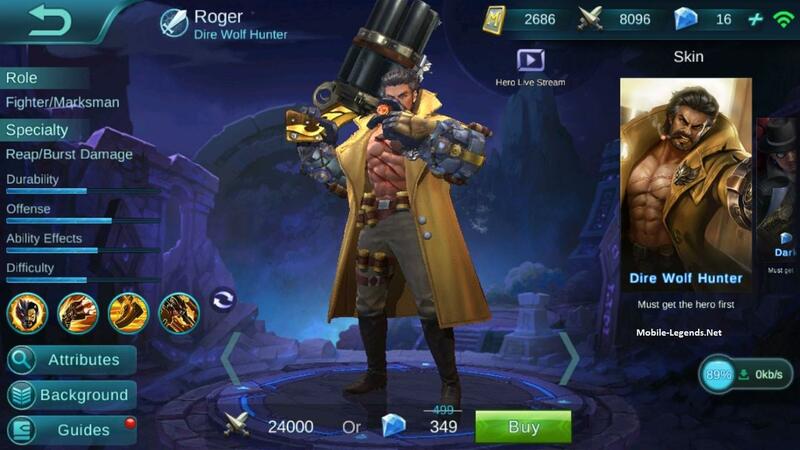 High Physical Damage and very high Lifesteal, it will give Roger all the self sustain he needs. Low Physical Damage and Crit Chance but very high Attack Speed, thanks to his passive we will get a lot more Attack Speed and some more Crit Chance. This item will increase our DPS by a lot, combining it with our 2nd skill in Wolf Form we will attack extremely fast. High Physical Damage and Physical Penetration, it also gives some nice additional damage versus buildings. This item will make sure that our damage will be high versus all kind of targets even if they tried to counter us by building Armor. Very high Physical Damage and medium Attack Speed and low Crit Chance, the passive can situationally increase our damage even more. Nice item to close the build to achieve insane damage potential. If there is an Estes in the enemy team buy Deadly Blade instead of Malefic Roar. In the ultra-late game you can consider selling your Warrior Boots for Immortality. What Boots do I Use Im getting Confused, Look, The first Build was Warrior Boots Then at the Shortly Damage Item For Roger Turns Out That The Warrior Boots Became Swift Boots. How Does This Happen??? I got 13 kills 4 deaths and 10+assists using hassas claws, dagger, berserkers fury, blade of despair, swift boots and vitality crystal.